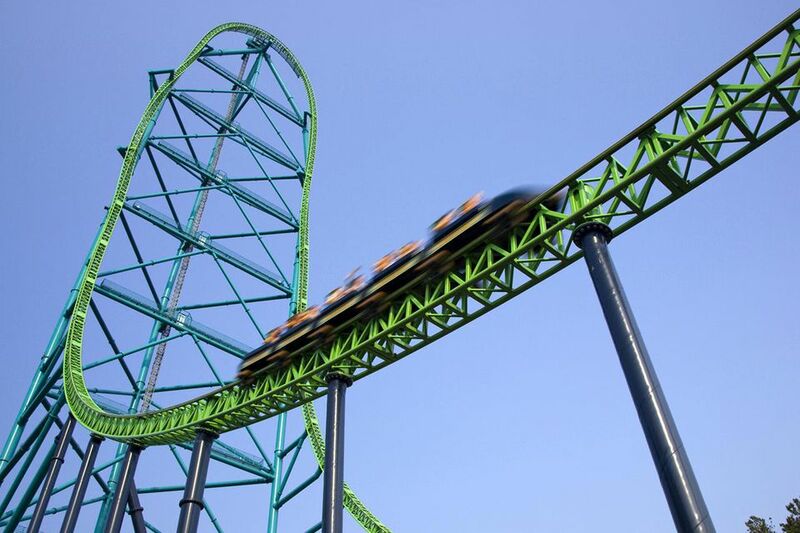 A Six Flags discount could be applied at theme parks throughout North America. There are also discounts available in Mexico. Add in the water parks and animal parks and the number of parks totals 26, with two more coming soon in China, Saudi Arabia, and the United Arab Emirates. Each has its own schedule of operations. There are two strategies for getting a Six Flags discount. One is to search for deals at the park you'll be visiting. Another is to buy a pass that's good at any one of them. In many of the parks, summer is the most important season and the time when the biggest number of visitors arrive. It's possible to make pre-season or early-season buys that will save you money during peak season. Six Flags parks offer a Season Pass and a Gold Season Pass. The Gold version adds parking and a feature called a Bring-A-Friend Free ticket, which enables guests to join you on certain days during the year. If you buy one of these passes, make note of when your park of choice closes down for the season. Although some passes will be good until the end of December, many other parks shut down for the year in October. Keep in mind that in the early and late months of a season, parks often are open only on weekends. In addition to the aforementioned pass benefits, you'll also be invited to free special events and receive a bonus book with more than $300 of in-park values. Whether or not all of those items are of use to you is another question, but the bonuses and the efficiency of having a pass make good sense and save money if you'll make multiple visits during a given year. The locations that have Hurricane Harbor water parks will accept the Season Pass for admission to those facilities, too. Pack a swimsuit. If you know you'll only visit a Six Flags property once in a season, it makes sense to buy daily tickets online and skip the long admission lines at the park. You simply pay, download and print your tickets at home. If you shop by property, the discounts sometimes go even deeper. Frequently you can buy daily tickets online for $10 - $20 less per person than the ticket window prices at the park. Newly added are the membership passes which can bring you a number of benefits including 50 percent off food, drinks, and merchandise. Here's a geographical listing of links that will take you to the online purchase point for these discounted tickets. Six Flags New England in Springfield, Mass., "the coaster capital of New England," has discounts for online daily tickets. The park is located south of Springfield on I-91, just north of the Massachusetts-Connecticut border. There is also an online discount at Great Adventure & Wild Safari near Jackson, New Jersey, about 25 miles east of Trenton. In upstate New York, Great Escape Lake George sells the daily pass online at a discounted rate that is lower than standard park admission. The park is located just off I-87, about 55 miles north of Albany and near the southern end of the lake. The park usually opens in mid-May and closes at the end of October. Six Flags over Georgia near Atlanta offers variable discounts, depending upon the date(s) you book. You'll find the park just off I-20 on the west side of Atlanta. Season tickets are available to everyone who purchases online for Great America in Gurnee, Ill., about midway between Chicago and Milwaukee. The park is adjacent to I-94. Save on regular admission buying online for Six Flags near St. Louis, billed as Missouri's "coaster capital." It is located west of the city on I-44 at exit 261. Six Flags Fiesta Texas near San Antonio offers daily tickets online below the gate prices at the park. Take I-10 west to exit 555. At Six Flags Over Texas in the Dallas-Fort Worth area, season passes are worth pricing. Daily tickets online are cheaper than prices at the park. The location is nearly midway between Dallas and Fort Worth on I-30 and Highway 360. San Francisco bound? Discovery Kingdom in nearby Vallejo offers an online cost well below the daily admission cost. The park is a few miles from I-80, and you can call 511.org to get updated traffic conditions. Magic Mountain near Los Angeles offers daily tickets at a discount when purchased online. Take the Magic Mountain Parkway exit from I-5. Six Flags Mexico is located in Mexico City. The discount passes include Hurricane Harbor Oaxtepec. You can also get food passes which will bring the cost of your visits down. Once you've purchased tickets and passes, take a look at a step by step approach to saving money in a Six Flags park.